The book is available in printed form or as a PDF file directly from the publisher and is also available from (so far: European) retailers. 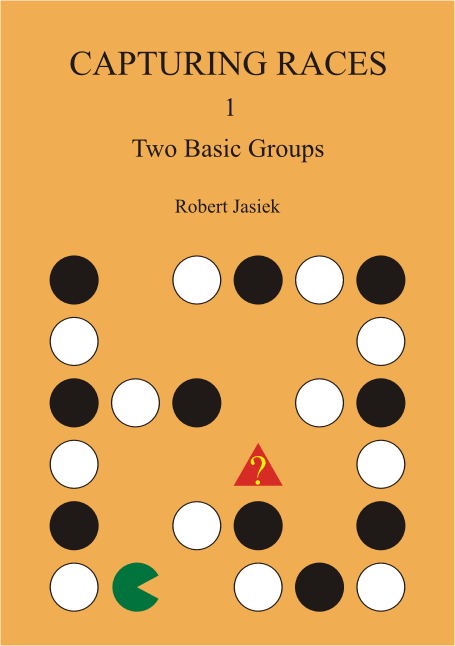 The author and publisher of Capturing Races 1 / Two Basic Groups is Robert Jasiek. The book is of A5 size, has 272 pages, has 3 diagrams per page on average, is written for players from 18 kyu to 7 dan and has the suggested price EUR 28 (printed book) or EUR 14 (PDF file). Robert Jasiek, Capturing Races 1 - Two Basic Groups, English, Berlin 2011, 272 pages, 28.00 Euro (PDF 14.00 Euro). Originally published in Deutsche Go-Zeitung (= ‘German Go Journal’), issue 1/2012, p. 22-23. Anyone who wishes to know everything -- and I mean really ‘EVERYTHING’ -- about the supposedly ‘trivial’ topic of a fight between only one solid string of stones of both parties is well served by reading this book. In order to first guard interested readers against potential misunderstandings, let me point out that the book deals with the “IF” -- not with the “HOW”. The book covers the fundamentals for answering the question “Should I play here?”, and sensitises the reader for several relevant cases. E.g. for a group that cannot save itself any more, and that becomes, unnecessarily, killed for a second time, just to be on the safe side. Or a Semeai, in which one side is so much behind that any attempt to rescue would mean only wasting a move. In the future, the reader can concentrate his/her efforts on capturing races in which he/she can gain something. I.e. saving an own group that the opponent cannot capture any more, or obtaining a group which otherwise could have been rescued by the opponent. The book does not provide ‘techniques’ in the strict sense. I.e., the reader will not find the treatment of Tesuji of the ‘Life&Death’ kind because the book really is not about HOW best to kill an opposing group -- but ‘only’ about IF one was to strike again. As can be expected from the author, the presentation of the book’s contents is particularly comprehensive. Used terms, definitions, concepts, etc., are consistent, and explained well. The English is easy to read. Chapter 2 lays the foundations for the theory building that will be constructed during the book, and specifies -- in great detail -- the later used terms that are partly newly introduced by the author. One or the other reader will be familiar with terms such as ‘favourite’ or ‘underdog’ from Richard Hunter’s book “Counting Liberties and Winning Capturing Races”. However, the reader should be prepared that -- in comparison -- the presentation in the reviewed book is considerably more extensive and exhaustive. In great detail, chapter 3 treats, as ‘Class’ 1, the parallel arrangement of two basic groups. As subdivision, the author introduces 5 types with up to 6 cases, which are partially re-used, partially extended in the following chapters. Chapter 4 presents a new Semeai formula that is elucidated and elaborated in great detail -- for all types and cases previously introduced for Class 1. Chapter 5 introduces, as Class 2, the ring formation (one group surrounds the other) of two basic groups. Chapters 6 to 9 describe, as Classes 3 to 6, one or two groups (in parallel arrangement) in Atari, or with open Nakade. These chapters are considerably more compact than those for the previous classes. In chapter 10, the author deals with earlier findings from the literature -- these are compared with his own insights, and offers corrections for identified weaknesses. A bibliography and a subject index complete the book. In my estimation, the book’s content is refined in such a way that each type of reader will find sufficient material to approach the issue presented. The usage of many diagrams -- for extensive, and detailed, explanations -- is helpful, so that also such readers can have a very good time who are less familiar with mathematics or computer science. Each chapter starts with a couple of problems that the reader can deal with -- however, does not necessarily need. There are always compilations of key messages, summaries of the previously written, repetitions of essential contents at the sections’ or chapters’ ends, as well as a somewhat formalised tabular short summary, and finally the solutions of the problems from the chapter’s start. The chapters’ structure to teach the Semeai classes is uniform. The underlying structure of sub-chapters as well as the always homogeneous compilation and structuring of the actual content secures a high recognition value. For this reason, and because of the very comprehensive treatment, for me, the book has also characteristics of a dictionary, or of an encyclopaedia. A certain formalisation -- typical for the author -- can be noticed but is not that extensive to be distracting. Only occasionally the author loses himself in the danger of wanting to be all too exhaustive, and to not miss any aspect. In my opinion, chapters 6 to 9 (Classes 3 to 6) are out of the ordinary, compared to the previously explained Classes 1 and 2 -- especially related to the evaluation of practical applicability. Obviously they are required for a complete description, also in the view of the planned subsequent volumes. With respect to layout and used fonts, the book is an easy read. I consider it a convincing idea to use a bigger font, combined with a more generous text arrangement, for the theory sections than for those parts of the books that comment examples in detail. In my opinion, the diagrams are unusually large in relation to the used font size; the capital letters therein are too massive. Presumably this is due to the parallel supply of a screen edition. My feeling is that the reader is not sufficiently guided in one decisive aspect -- and this is the necessary paradigm shift required for the study of Semeai, for those who come from the world of ‘Life&Death’ / ‘Tsume-Go’. Contrary to the usual experience, two eyes are absolutely counter-productive when dealing with ‘Semeai’. If one side has got the benefit of two eyes, the ‘Semeai’ issue is grounded from the outset. In the same sense, it is already harmful to have the potential for getting two eyes. The tables would have profited from a further systematic compression, for the sake of better recognition of overall dependencies by the reader. To really gain from the book, it will be necessary to read it several times. Even then, after finishing the book, the one or the other reader will stay behind with an unspecific feeling of having missed something decisive. However, this is not true. You have to hold in mind that the book treats only comparatively simple Semeai. All the difficulties that you will encounter in real life are reserved for subsequent volumes. So, I cannot answer the question to what extent reading of only this volume of the series helps for strength improvement. Regardless, the book provides an important step forward in the field of go theory. The book Capturing Races 1 / Two Basic Groups can be read as a textbook or used as a reference dictionary. A textbook reading is supported by introducing the terms and basic theory before applying it and by preceding every central chapter with problems and concluding it with their answers. Thereby the reader can verify whether he has understood and can apply the theory correctly. The book serves also as a dictionary because the classification of capturing races with two basic groups is complete and many chapters have overview or summary of the principles. Most of the 272 pages carry these five chapters or groups of chapters: Terms and Basic Theory (43 pages), Class 1: Two Basic Groups, No Kos, No Approach Defects (132 pages), New Semeai Formula (7 pages), Classes 2 to 6, which are variants of Class 1 (54 pages), Correcting Mistakes in Literature (16 pages). Introduction, literature list and index round off the book. A semeai class refers to all capturing races with the same general properties. The basic theory chapter defines all the necessary terms such as 'semeai eye', 'stable', 'strong' and 'favourite'. Only due to this very careful preparation, completeness of the case classification could be achieved and players can know in general which principles apply and which don't. Otherwise application of the same popular mistakes found in literature would continue. Now they are revealed and a weak result of earlier research is replaced by one of the book's highlights: The 'new semeai formula' expresses the elegance and power everybody desires because of being easily applicable to all the 24 cases of Class 1 semeais. Recognition of a new concept different from approach liberty and invention of the term 'fighting liberty' make this possible. While the five basic semeai types 'no eyes', 'each side has a small eye', 'each side has a big eye of the same size', 'only one side has an eye' and 'one side has big eye and the other side has a smaller eye' are known in earlier literature, this book goes one level deeper and describes all the 93 possible cases. For a semeai class and type, every case distinguishes different conditions such as numbers of exclusive approach liberties and some of the over 200 principles state which to count to determine status and outcome. The applied illustration uses simple and clear examples to assist fast learning of the theory. Together with a meticulously carefully chosen order and structure of the types and cases and textual and tabular summaries at the chapters' ends, the reader is motivated to absorb everything and keep it in memory permanently. The book combines refined earlier knowledge and many new discoveries and presents everything with such a great clarity that players from beginner to top level will get a good understanding of the basic capturing races. Even the author doubled his related knowledge while writing the book. Principles don't attract you, you solve each basic semeai correctly within a few seconds and you are interested only in complicated kos? Then reading some dan player's problem collection might be a better choice. Everybody else gets the capturing races' state of the art as a solid fundament for his games. It is, e.g., possible though that outside and inside approach defects need to be split in two volumes or one ko on the outside, on the inside or in an eye requires more than one volume. Since the plan is an essentially complete study of all capturing races and a great advancement of Go theory, there will be as many volumes as necessary and research and writing them all can take a couple of years. SiouxDenim Did this book get copy-edited by a native English speaker? The Sample Material seems useful, but the language is rather awkward. RobertJasiek: A native English speaker has not proofread the book. I considered a possible delay by 4 to 12 weeks for that too great. If you have suggestions for a second printing's language improvement, please send them to me by email. It is more interesting to discuss the book's go terms here or rather on a subpage of this page. RobertJasiek: SiouxDenim, not wiki vandalism but I think that using subpages like CapturingRaces1/Discussion are more appropriate for discussions. Please see my question to you there!